The post 3 Beachy Easy Easter Décor Ideas appeared first on Barbara Culkin Styling With Intention. Spring is in the air and decorating for it gives off a Spring fever vibe. So whether you’re hosting the Easter holiday at your home, at the beach, or just decorating with Easter décor, why not have it look stylishly seasonal as well as work in your favor too? Easter is the time of renewal, re-birth, growth and life. The world is in bloom and by enhancing your home for this Easter holiday and Spring season, you’re creating a powerful energetic vortex to bring your heart’s desire to you. Pretty cool, right?! 1) Bring on the Green! 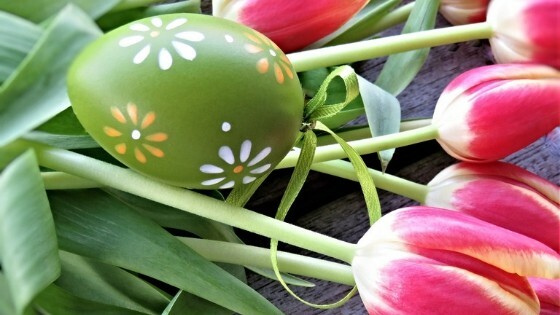 Green is the ideal color to use with your easy Easter décor. The color green symbolizes new beginnings. It’s also the color of balance, growth and harmony. Incorporate shades of green into your color scheme with your décor, when setting the table and of course your Easter eggs! You can easily do this by picking a green tablecloth and napkins with festive Easter napkin rings at your Easter brunch or dinner. Enhance with Easter plants and flowers for an extra special refreshing touch of green! By decorating with the color green in your home, it stirs up the lucky Easter energy. If you’re hosting Easter brunch or dinner, of course, you’ll be serving yummy food at your celebration. A chic tablescape will make quite an Easter impression! Brighten up the table with Spring splash of color with a beautiful arrangement of tulips in a vase tied with an elegant ribbon. To tie in a hint of coastal and beachy inspiration, place little seashells around the table . 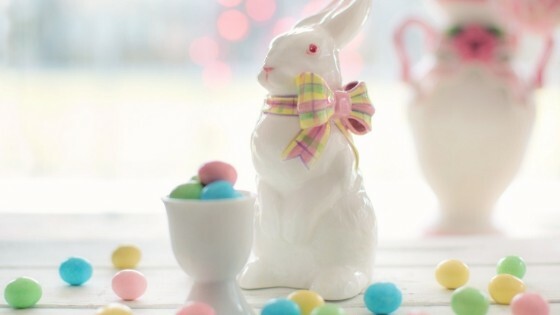 Add in some bunny and Easter egg tabletop décors such as plates, glassware and serving bowls. For a touch of creative fun, use novelty items such as bunny napkin holders, place card holders, wine charms and bunny-shaped salt and pepper shakers. One of my favorite ways decorate for Easter is to of course add in some beachy fun and coastal touches. Whether you’re entertaining in an elegant or relaxed way, this beauty will be sure to make a coastal statement! 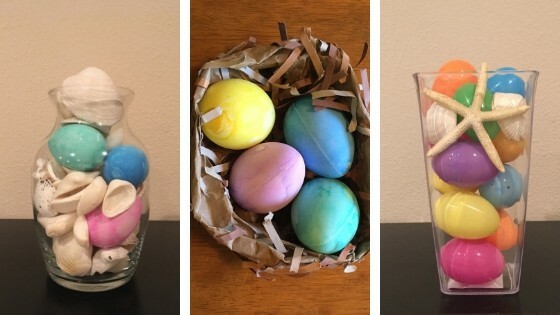 Here’s an idea- fill empty glass vases with seashells and colorful Easter eggs décor. Yes- its that simple! This makes a stylish, coastal and easy Easter décor piece. If you’d like, you can add in an LED candle for a laminated look. Being a mama, I know that my kids like to be a part of everything. And they too would like a décor piece at their kids table for Easter. So, for them, I simply use a clear heavy duty plastic vase and fill with seashells and colorful kids eggs. Or you can put artificial painted Easter eggs in a décor nest basket. Both are quite the ‘eggcellent’ Easter tabletop hit with the kids! By creating a festive Spring ambiance and beachy Easter mood, you’ll create an unforgettable impression and fill your guests with blissful creative inspiration and possibilities! The post Seashell Wish Candle to Supercharge Your Full Moon Intention appeared first on Barbara Culkin Styling With Intention. The energy of the full moon is very powerful and can bring your intentions to life! Why not use that to magnetize your deepest wish? One of my favorite ways to do this is to create a Seashell wish candle. Seashells have a magical manifesting element to them and the lighting of the candle focuses your intention on it and energizes your wish. This first step to manifesting anything in your life is to get crystal clear about exactly what you’d like to create. The Universe is always listening. When you get super clear on it, the Universe steps in. Once you’re clear on your heartfelt intention, get an index card and write your intention on the index card in red pen. Red is an attracting and magnetic color. When you put it in red- Bam! It sends the message loud and clear! Next, get a large seashell and fill it with some sand. Once you do that, place a small tea light candle in it. If you prefer a mini tea light LED candle, you can use that as well. You then place it over the index card with your intention. Place the lit seashell wish candle under the light of the full moon. If you live in a space that the light won’t directly get it, no worries. It’s your INTENTION that matters most! Also, always make sure to keep in a safe place away from wind, small children or pets. If its an LED candle you can keep it lit. It you have a tea light candle with a flame keep it lit for a short while or until it burns out . As the candle is lit under the light of the full moon, close your eyes and visualize your intention as if it has already happened for you. Picture white golden light all around you and your wish. Imagine this white golden protective light having magnetic power and pulling your desire into your life. How would that make you FEEL? Pour all those delicious feelings into your picture. Make it as clear as possible. See it and feel as here in your life NOW. Then release it to the Universe and trust it will happen at the perfect time. Sometimes we want things to happen on our time frame and then feel it’s not fair when it doesn’t come when we want it to. But know, the Universe ALWAYS has your best interest at heart and has a bigger plan for you than you know. Trust it and believe! Your seashell wish candle not only makes a cool, coastal décor piece but its also an uplifting symbol of your wish and a that your intention is in the making right now! You can also check out my video on manifesting a wish for a Full Blue Moon for some more inspiration. The cool, crisp Fall days are upon us. The post Entertain and Decorate with Gratitude This Thanksgiving appeared first on Barbara Culkin Styling With Intention. The cool, crisp Fall days are upon us. The leaves turning beautiful colors and the days are getting shorter and the nights longer. November is Autumn at its best! It’s time to decorate with gratitude. This is a perfect time for reflection and going within. If you don’t already do any type of meditation practice, this is a great time to start. Even a few minutes a day – close your eyes and take a few deep breaths- and go within. It’s a good way to relax – even for a few minutes in the course of your day. Also a good time for reflection! In the course of our busy days, deadlines, time frames and to-do lists, it’s good to take a step back and have a mini- inventory with yourself. Take a look at your space- both inner and outer and see what works. Is there anything you want to make improvements on- what’s working well for you, what’s not and so forth? Taking time to step back and reflect helps us gain clarity about where we are and where we want to go. This is especially important to do before the start of the holiday season coming up. With the cooler weather here, it’s a perfect time for indoor entertaining. Whether you are hosting a cozy Autumn dinner party, elaborate Thanksgiving dinner party, wine and cheese night or coffee and dessert night with family and friends, setting the ambiance for your party is the key to successful entertaining. I now set the intention to give thanks for all the beauty in my life. Also, keep in mind that there are some fun and favorable ways to decorate and boost up the energy with your décor! To create an elegant Autumn look, make sure to purchase some Fall tabletop décor for your dining room and kitchen. Set the Autumn mood with a rich burgundy, harvest rust or toasty taupe tablecloth and a festive Fall themed runner for your dining room table. Top it with a beautiful harvest leaf centerpiece with candles, a glass hurricane with a large colored candle, or a vase filled with harvest décor filler items such as berries, chestnuts, acorns, mixed colored leaves and so forth. Gold and earth tone colors work very well in the center of your space to create harmony and wellness in the space. Place a large bouquet of sunflowers on your dining room or kitchen table for an Autumn uplifting vibe. Pumpkins, gourds, fruits and especially cornucopias are excellent energy enhancers and are reminders of prosperity and abundance. If you’re hosting Thanksgiving dinner, add in some turkey, pilgrim and pumpkin tabletop décor such as plates, glassware and serving bowls. Also, add creative fun novelty items such as turkey napkin holders, place card holders, wine charms and turkey-shaped salt and pepper shakers. Thank you for the beauty and wonder I’m surrounded by in my life. Most importantly, always be in Gratitude. Embrace time with family, friends and loved ones. Give thanks for the special moments in your life and those wonderful ones coming! The post Style Your Home for a Spooky Halloween Celebration appeared first on Barbara Culkin Styling With Intention. The post Create a Cozy Autumn Ambiance appeared first on Barbara Culkin Styling With Intention. Fall is in the air and with the cooler weather approaching, it’s a great time to make your space a cozy haven to curl up in! Restyle your home to create a warm, cozy and inviting Autumn ambiance. Add enhancements that reflect your personal style and reflect you! This best part is, you can create this cozy Autumn haven at ANY budget! I now set the intention to create a comforting Autumn space to relax in. Thoroughly clean your space – wash windows, the door, the rugs, etc. One of the best times to paint is the Fall. The weather is cool and crisp and the paint dries quickly. Move around 9 things in your space to a new place to stir up the energy. Doing this monthly is great! Surround yourself with cozy fabrics, fuzzy shag rugs or faux fur or chunky knit throws in a rich chocolate brown, warm caramel or chic black color. These are warm, funky and add an elegant feel to any space! Add a few seasonal throw pillows with Autumn themes or colors in your living room or great room. Fall is definitely in the air with Autumn scented candles such as pumpkin pie, cinnamon stick or apple spice. Pick your favorite! If you are concerned about burning candles, a great alternative is to purchase LED scented candles. They look pretty and are flame free! And for incense, Nag Champa is an excellent choice for cool, crisp weather! Purchase new sheets, curtains and drapes in warm, rich textures and colors and textures to welcome in the Autumn season. Mums are the flowers for this season! Purchase some mums and place them in a potted stand at your front door entrance or any place in your home where you love to have your plants. They create an inviting Fall feel. If you love to entertain and host dinner parties, make sure to dress up your formal dining room and kitchen with Autumn décor. On your dining room table, place an eye-catching centerpiece with leaves, bright candles and berries to set the mood for an Autumn evening dinner party. Or place a large hurricane glass candle holder or vase filled with vase fillers such as decorative mixed leaves, cranberries, acorns or mini pumpkins. Purchase fun leaf shaped placemats, as well as Autumn, themed towels and oven mitts for your kitchen. Remember, you want to make your place a space you feel comfy in. It’s what makes the difference between a house and a home. My home is a serene haven filled with Autumn joy! By creating this cozy haven to retreat in during the Autumn season, you’ll feel nurtured and this will promote a vibration of positive well-being in your surroundings. The post Back to School: Style Your Kid’s Room for Better Sleep and Wellness appeared first on Barbara Culkin Styling With Intention. Take Spring Cleaning to a new level and Organize with Intention! These tips keep your spaces clean, organized and refreshed. They can be used all year round, not just for Spring. The post 10 Spring Cleaning Tips For a Clean and Organized Space appeared first on Barbara Culkin Styling With Intention. Spring has finally arrived in full swing! There’s a feeling of rebirth and possibility in the air, but you’re feeling blah? It’s time to stir up the energy of your space and add some spice to your life! If you haven’t done any Spring cleaning yet, now is the perfect time to do so. Before doing any makeover or re-decorating project, clear the space to have your place flow freely. Remember, nature abhors a vacuum. Remove one thing and something new comes in. Pretty cool, huh? When ready for change, it’s a priority to clear out the old to make way for the new! I now set the intention to get clean, clear and organized. The key to really get the energy flowing is a healthy dose of clutter clearing. I know you may be saying- I’d like to, but there’s too much, or I like to keep everything- just in case and the list goes on. But the main point is to start small. Don’t fall into overwhelm. Doing a little at a time leads to tremendous progress. By taking baby steps, as time goes on, you’ll be a pro at clutter clearing. Give your space a good scrub down to feel focused and clear! Dust, vacuum, scrub-EVERYTHING! Your place will feel clean, fresh and alive! Do one room at a time. If you feel you don’t have the time do such a cleaning yourself, ask for help. Ask your spouse, friends, children, parents, cousins etc. -whoever is willing to help & pitch in. Make a party out of it, you’ll have a blast and your place will feel rejuvenized! If this feels too time-consuming for you, hire a cleaning person or service to clean your space and make it feel renewed. Clean the windows and open them up as well! Especially after a long and cold Winter, let in some fresh air. Many times I see people have the heat on all Winter and as soon as it gets a little warmer they go right to turning on the Air Conditioner. You want to clear the stale energy especially after a long winter of colds, cases of flu, etc. Get ready for the fresh Spring air! 4) May I Come In? Create visionary curb appeal. Clean the front door well to invite new opportunities into your life. If it’s chipping or needs a new paint job, give it a fresh coat of paint ASAP. This simple quick and easy fix will make a huge difference in your home’s appearance and bring goodies into your life! Stir up the energy by moving around at least 9 things in your space that have been in the same place for months. Pictures on the wall, frames, appliances, magnets on your refrigerator- whatever you feel urged to move! Have fun with it! Make room for that hot, new summer wardrobe by clearing out closet clutter! This one is a toughie for many of us! How many of us keep shoes or outfits we haven’t worn in ages in our closets? Sneakers from high school (yep, that was me), that dress that brings back memories, those pair of pants we keep hoping to wear again someday and so forth! If you haven’t worn it in over a year or more, or it doesn’t fit properly- it’s time to say Adios! You can give to a friend or family member or donate to a clothing drive. You’ll feel good and have good karma too! Clear clutter from under the bed! This attracts excess baggage in your life which you and I know, you don’t want or need! If you don’t use it, move it out of there. The space under the bed should be clear for the energy to flow freely. We love our furry, four-legged friends, but make sure to clean up all pet hair from under and behind the furniture and as well as your entire space. Also, make sure to organize pet supplies and accessories. I recommend using fun colorful stylish baskets. Plants are excellent energy enhancers! Plant some flowers, buy some plants or Feng Shui your garden! If you feel you don’t have a ‘green thumb’, buy some low-maintenance plants for your space indoors. Space clearing is also a good way to clean the energy of your space. If your place doesn’t feel good, or you have trouble sleeping, you may want to hire a professional that does space clearings. They can be very elaborate or simple. Your place will feel very peaceful. Place a bowl of sea salt in each corner of the room, apartment, or office- whichever room you are clearing. After a week or so, remove the sea salt. You can burn sage in your space too. This is a good cleanser but some people really dislike the smell! If that’s the case, you can buy a sage spray that’s lightly scented and very pleasant. Also, burning some cleansing, lightly scented candles or incense are terrific choices too. Set the intention to do 3 or more of these tips. Organizing your space is about getting into a routine. Start with these and by repeating monthly will help keep your space clean and organized. You can keep your space clean and organized by breaking it up into little steps. After completing the three steps, mark it on your calendar to do another one of these steps in a month. I now have a clean and organized space. Imagine feeling more energized with an organized and clean space. The post Instantly Minimize Entryway Shoe Clutter appeared first on Barbara Culkin Styling With Intention. Do you feel stressed out and overwhelmed the minute you walk into your home? Do you feel clutter is busting at the seams from every corner of the room? If you’re a parent- you especially know what I’m talking about! Your kids come home from school and one shoe comes off in one direction and the other shoe goes off in the opposite direction. You have a multitude of shoes in your doorway- school shoes, sneakers, soccer cleats- just an overload of shoes. You get the picture! I love shoes- I REALLY do! But not when I’m tripping over them! I want to share with you a quick remedy for the shoe clutter dilemma and how to quickly get it organized. I am willing to try a new method to resolve shoe clutter. This easy solution is a favorite of mine! Put a large, stylish decorative basket by the front door entryway. Pick a color that matches the color scheme of your style and décor. Pick a chic decorative canvas print or woven, wicker basket- not a laundry basket! If you can find one with a top lid- even better! By placing all the shoes in there keeps everything in one place and appears organized. You can have multiple ones if you’d like. For example, I have one bigger basket for my shoes and another bigger one for my husband’s shoes and two smaller baskets for each of my boys shoes. What I love about this solution is that it looks nice, clean and helps keep everyone organized. When you walk thru your front door and you’re tripping over a pile of shoes, it creates chaos. You can’t find the other shoe especially when you’re rushing to get somewhere and everyone gets frustrated! We’ve all been there! This simple basket method is such a lifesaver! You can also place one in different locations in your home, such as by the door in the mudroom or garage. I actually placed one at our backdoor lanai. I got a decorative metal aluminum bin with a beach scene on it for flip-flops. We’re a beach loving family, so we accumulate a lot of flip-flops! This keeps them really organized. By just throwing them in the bin, it’s easy to find and hassle free! I now have an inviting, organized entrance in my home. Imagine being able to breathe easier in a stress-free, stylishly organized and tranquil space without shoe clutter! The post Decorating With Inspiration To Lift Your Spirits appeared first on Barbara Culkin Styling With Intention. What gets your juices flowing and makes your heart sing? What’s your inspiration? Did you know what surrounds you in your living space has a HUGE impact on your thoughts, feelings and outlook on life? Decorating is my passion. And I’m especially passionate about helping people design for their dreams. I want to share a secret tip with you when decorating your home. I’m taking the steps to decorate my space intentionally for my goals. When you’re purchasing décor for your home, make sure to pick pictures that make you FEEL GOOD. Your home is your haven. It’s your place to relax and unwind. Surround yourself with beautiful uplifting photography, personal keepsakes and reminders of what you aspire to be. You want to surround yourself with items you love and colors that promote well- being and tranquility in your space. If there is an aspiration or goal you want to achieve, decorate with symbols of that intention in your space. By incorporating this into your home decorating scheme and keeping it as a visual reminder, you are one step closer to achieving it! For example, if you wish to own a home by the beach, hang some pictures of beach scenery and nautical decor in your home. Or if you aspire to be a writer, surround yourself with items that represent that desire and hang pictures of it in your office. Knowing this, take a good look at your home. Look at the pictures and paintings on your walls and the décor in your home. How do you feel when you look at them? Do you feel relaxed and at peaceful? Do you feel inspired and motivated? If not, it’s time to turn that around! If there are any pictures or paintings hanging in your home of negative or dark depressive scenery it’s best to remove them. This also goes for broken, cracked family stuff and furniture that you’re holding onto at your house out of guilt. If you feel they’re bringing you down, they will not elevate your mood. The goal here is to uplift you to attract what you want to manifest. We all have our own unique style and taste. What may be your desired look may not be someone else’s and that’s OK. Change starts with YOU. This is your creation and you get to pick! Remember it’s your life that’s being created here and you want to be surrounded by positive decor that creates a haven that promotes well -being and peace. This is what decorating with inspiration and styling with intention is all about! By restyling your home with décor that uplifts your spirits and elevates your mood, you will feel more positive, motivated and happy. The post Instant Closet Transformation to Look Great and Feel Confident appeared first on Barbara Culkin Styling With Intention.